We set out for a Two-State Rifle challenge with our friend and professional long-range shooter, Stan Pate. Check out this amazing 1,840 yard shot on the California-Nevada border! You read that right?our factory rifle + Federal Premium factory ammunition?hit that steel target at over one mile away. Stop the biggest game in its tracks and beat the toughest conditions with the Savage 110 Brush Hunter. Length-of-pull is easily customized to fit any shooter for comfort and consistency. Learn more at savagearms.com. Built to maximize accuracy and packed with specialized features you’ll find nowhere else, the Savage 110 High Country puts the biggest bulls and the longest shots within your reach. Learn more at savagearms.com. The Model 110 Hog Hunter is as tough and versatile as the animals it’s built to hunt. Its oversize bolt handle allows for fast followup shots, and the detachable box magazine never catches on brush in the tangled thickets where hogs love to hide. Making an extreme range shot on the trophy of a lifetime requires not only a rifle built for accuracy, but a rifle built for you. The 110 Long Range Hunter’s 26-inch button rifled barrel provides the utmost precision and consistency, and it is capped with an adjustable muzzle brake. The better a rifle fits you, the better you?ll shoot it. That?s why Savage created the AccuFit system, which comes standard on select rifles in the new Model 110 line. Learn how to fit yourself to the platform using included length-of-pull and comb height inserts. See more at savagearms.com. Meant for making fast, accurate shots from a variety of shooting positions, the 110 Scout is built to be a natural extension of the shooter’s body. Its rugged synthetic stock, forwardmounted rail and adjustable iron sights are perfectly suited to the versatile platform. Blend pinpoint precision and torture-tested toughness to beat the most challenging targets and conditions. The Stealth Evolution pairs a heavy fluted barrel with a monolithic aluminum chassis finished in rugged bronze Cerakote®. When the stakes are high, settle for nothing less than the precision and adaptability of the Savage 110 Tactical. It features a suppressor-ready threaded barrel, a one-piece scope rail and 10- round detachable box magazine. The new Savage AccuFit system uses an exclusive combination of interchangeable comb risers and length-of-pull inserts to create a custom fit for any shooter. Learn more at savagearms.com. A precision-built laminate stock and heavy fluted barrel extract even better accuracy from this addition to the A22 platform. The A22 Target Thumbhole uses a straight-blowback action for extremely reliable semi-automatic performance. Savage’s semi-automatic A Series has proven itself for reliability and accuracy. Now hunters have even more effective options with the A22 Pro Varmint line. The rifles’ Boyds Pro Varmint stock provides superior ergonomics and an extremely stable platform for the 21-inch fluted heavy barrel. Southpaws now have a bolt-action built for them. Our B17 F uses an ergonomically designed stock, higher comb, top tang safety and target style, vertical pistol grip to allow shooters to hold the rifle in a more natural position that puts less pressure on the wrist. We’ve has added to our popular B Series line of modern bolt-action rimfires with new compact models built to fit smaller shooters. The B 22 F Compact and all B Series firearms have an ergonomically designed stock for more comfortable, more accurate shooting. To finish at the top of any event, shooters need the customization and precision engineered into every facet of the new MSR 10 Competition HD. 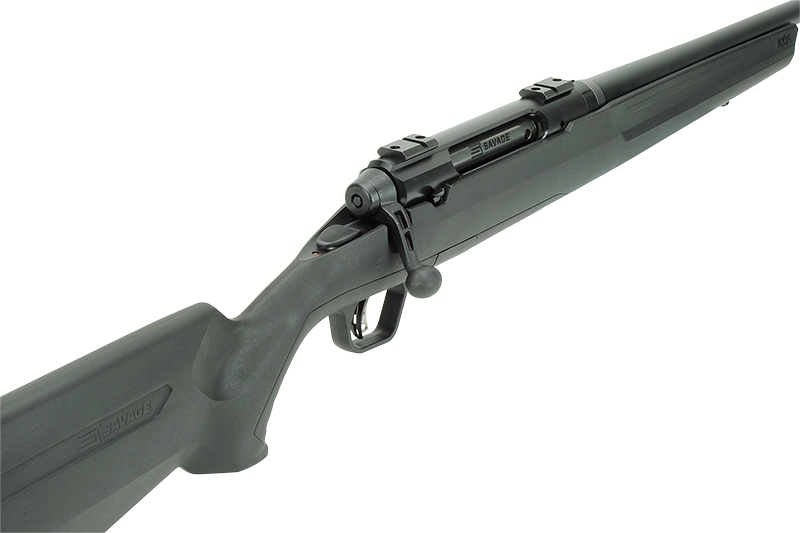 Its advanced barrel is built specifically for the rifle in a collaborative effort between Savage® and Proof Research®. Claim your advantage. The Savage MSR 15 Competition and MSR 10 Competition HD bristle with upgrades and customizable features that will put you on top in any event. Learn more at savagearms.com. Savage has added an adjustable gas block and longer barrel to stretch the out-ofthe-box performance of its MSR 15 Recon platform even further. The Recon LRP features an 18-inch barrel to optimize velocities and accuracy, and its gas block can be customized to specific ammunition for the best possible cycling. The Savage® MSR 15 Valkyrie gets maximum performance from the all-new 224 Valkyrie cartridge, which was pioneered by Federal® Ammunition to offer the best ballistics of any MSR 15 caliber. It delivers supersonic velocities at as far as 1,300 yards, extremely flat trajectories and match accuracy. The Rascal Target XP isn’t just safe and easy to use—it’s also more accurate, adaptable and prepared for the range than any youth rimfire. Savage’s Clay Belding walks a young shooter through all of its features. Learn more at savagearms.com. The Rascal Target XP isn’t just safe and easy to use—it’s also more accurate, adaptable and prepared for the range than any youth rimfire. Savage’s Clay Belding walks a young shooter through all of its features. The better a rifle fits you, the better you’ll shoot it. That’s why we gave our B Series bolt-action rimfires a modern ergonomically designed stock with a higher comb, top tang safety and target style, vertical pistol grip. If you want to fill tags, you need firearms built for everything that real-world hunting can dish out. So we created the Hunter Series. The rugged, accurate bolt-action firearms are built tough and loaded with hard-hitting features that will make you more accurate and lethal. Squeeze more from the high-performance rimfire cartridges with our Magnum Series. These tack-driving, bolt-action rifles feature Savage’s legendary user-adjustable AccuTrigger™ technology and come in stock and barrel options for any rimfire pursuit. The oldest continuously manufactured bolt-action rifle in North America is now even better. The 110 Series has a fresh look and a full complement of improvements. Select models feature the AccuFit™ system, which lets you lock in a custom fit for fast target acquisition and enhanced accuracy.